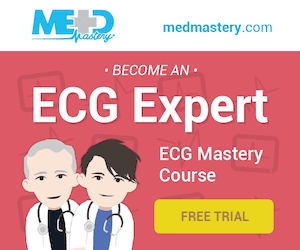 A 27 year old female with metastatic ovarian cancer for whom curative options have been exhausted arrives in the emergency department in extremis. Her history is of rapid onset (over a few hours) of shortness of breath, high fevers and rigors. 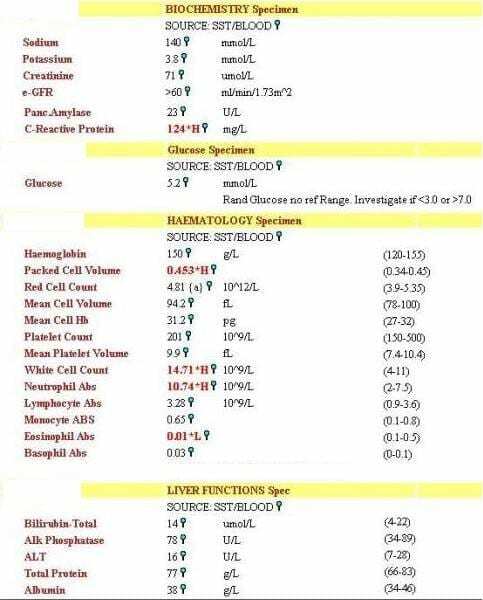 Her vital signs on arrival in the emergency department are as follows HR of 190, BP 80/30, RR of 65, temperature of 39 and saturations of 90% on 10L via face mask. This patient is critically unwell and requires immediate assessment and resuscitation in an appropriately monitored environment. A team approach will be required and initial management should be directed towards establishing adequate airway, and stabilising breathing and circulation. On the face of things this sounds bad. In a patient with metastatic cancer in whom all curative options have been exhausted it is necessary to weigh the burden of invasive treatment against the potential benefits; however, unless you can rapidly gain information from the patient, the patient’s family or someone else regarding limitations of therapy, it is better to address the immediate crisis now then ask questions later (in my view). Q2. Describe the chest X-ray. 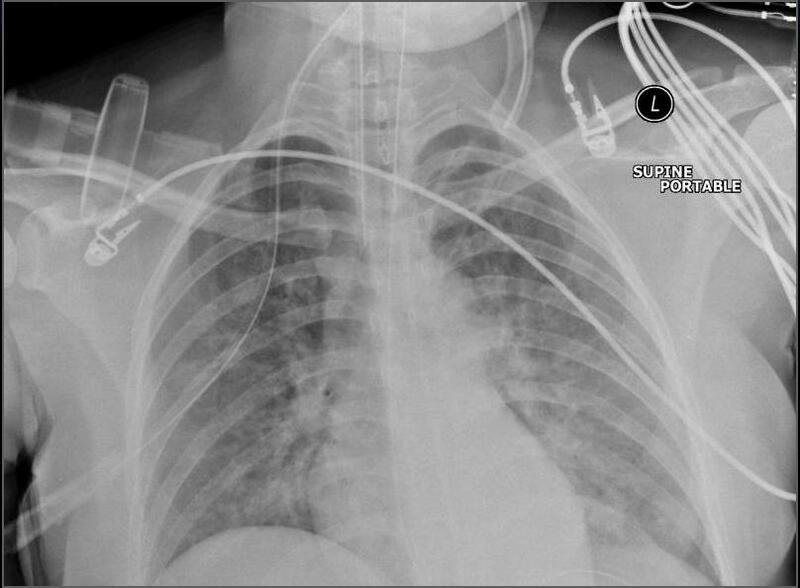 This chest X-ray shows an endotracheal tube in appropriate position and a nasogastric tube in appropriate position. There are diffuse bilateral pulmonary infiltrates with air bronchograms visible. Q3. What is the likely diagnosis? Q4. 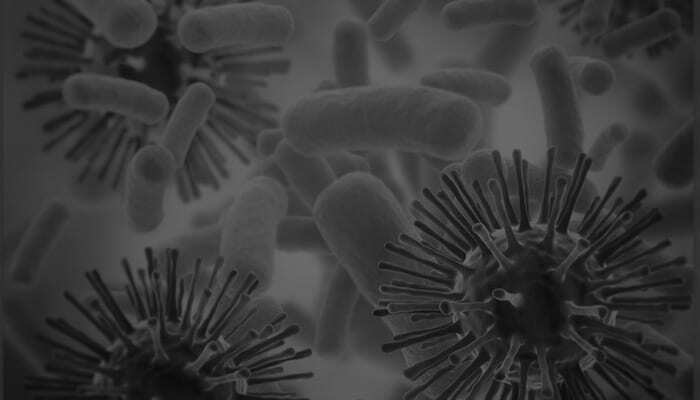 What are the likely causative pathogens and what empirical antibiotics would you use? This picture of very rapid onset is typically seen with pneumococcal or staphylococcal pneumonia. It may also occur with Streptococcus pyogenes pneumonia but this is a relatively rare condition. Empirical antibiotics will vary according to local susceptibilities; however they should cover Pneumococcus (eg 2nd or 3rd generation cephalosporin) and Staph. including community acquired MRSA (e.g. clindamycin if local susceptibilities allow or linezolid or vancomycin). I would also cover atypical organisms with a macrolide in the first instance. In this case, the diagnosis of pneumococcal pneumonia was confirmed by a positive urinary pneumococcal antigen. This patient had rapidly worsening shock and deteriorating respiratory and renal function over the first 8 hours of hospital admission; however, she rapidly recovered. She was extubated within 24 hours and inotropic support was rapidly weaned. She was discharged from hospital 72 hours after admission. A useful point here is that a patient with very rapid onset of severe bacterial infection who receives very rapid appropriate antibiotics can recovery rapidly.